We’d love your help. Let us know what’s wrong with this preview of You'll Die in Singapore by Charles McCormac. To ask other readers questions about You'll Die in Singapore , please sign up. I've read a fair few WW2 books but none centered in Asia or featuring the Japanese so I was eager to read this memoir and especially because I've been to Singapore and like reading books on places I've visited. Im ashamed to say I thought the war mainly focussed on Europe but I was wrong. This is an interesting read about a British solider captured by the Japanese in Singapore and his escape to Australia. I found this quite an eye opener. This book is an really awesome book that presents bravery and risk of life. This book tells about a group of men who escaped from the prison camp in Singapore and used no map and no compass and escaped from Singapore to Indonesia to Australia. I don't really know much about the Pacific war in WWII. The invasion of Singapore as told in this memoir is a horrific, unprecedented event, bewildering to the Europeans in the city. McCormac's story is a brutal account of his escape from a POW camp in Singapore and his subsequent trek through Malaysia. He and his companions try to make their way back to the Allies, narrowly avoiding Japanese patrols and troops. The author and his companions suffer illness, hunger, thirst, and all the dangers th I don't really know much about the Pacific war in WWII. The invasion of Singapore as told in this memoir is a horrific, unprecedented event, bewildering to the Europeans in the city. The author and his companions suffer illness, hunger, thirst, and all the dangers the jungle can throw at them. Their encounters with the people they meet are just as harrowing as the jungle dangers - can they trust the Javanese and Malaysians they meet? Are the villages helping the Japanese? Why are they being helped - is there an ulterior motive? This is a fascinating insight into the Japanese invasion of Singapore and what life under their rule was like in the POW camps. Their escape was brave and brilliant. A very worthwhile read. 3.8 stars : An amazing account of a POW's escape from Japanese-occupied Singapore, and the hardships he endured over 5 months to reach Australia. I feel that more factual detail about the escape and less literary description would have made this account work better. Brutal and gripping page turner. Shame about the typos. I was given this book to read when I wanted to know more about the war in the Pacific during WW2. This is a really good account of a WW2 escape that also happens to be a great story. This book was recommended to me by my dad and I have to say I'm glad I read the book. Once you read this book it is hard to imagine it really happened! A male main character as the writer Charles McCormac is also the main character because the book is about his escape from a P.O.W camp. This book also teaches you about another time in history. It teaches you how the Japanese fought wars, what the P.O.W camps looked like, how they were trea This book was recommended to me by my dad and I have to say I'm glad I read the book. Once you read this book it is hard to imagine it really happened! This book also teaches you about another time in history. It teaches you how the Japanese fought wars, what the P.O.W camps looked like, how they were treated there and about cultures of the natives around Singapore and Java. This book teaches me about other cultures of the natives around Sumatra and Java. The book told me how much hospitality they gave and the fact that you have to accept what they give you as a sign of respect and politeness. My favorite quote from this book is: "Too bloody true" this is said many times through out the book and it shows the harsh reality of them being stuck in an unfamiliar country. I learned about how the Japanese treated their prisoners of war and how the natives treated their guests with such respect and politeness. My father bought me this book, mainly because my grandfather was a civilian internee in a Japanese concentration camp in North Borneo, and he knows that I am particularly interested in this topic because of my family history. My grandfather, like the author, suffered brutalities under the Japanese, and so I could easily connect with this book as I read it. Charles McCormac's tale of escaping from a Japanese POW camp in Singapore to Australia is a fascinating one, and provides a very gripping read My father bought me this book, mainly because my grandfather was a civilian internee in a Japanese concentration camp in North Borneo, and he knows that I am particularly interested in this topic because of my family history. My grandfather, like the author, suffered brutalities under the Japanese, and so I could easily connect with this book as I read it. Charles McCormac's tale of escaping from a Japanese POW camp in Singapore to Australia is a fascinating one, and provides a very gripping read. Whilst not great literature, the book still effectively captures the chaos of war whilst keeping readers engaged in a thrilling plot and compelling characters. You can count on one hand the number of successful escapes from POW camps in Asia during World War 2. The author of this book was one of those men. A combination of sheer willpower, friendly Sumatran and Javanese natives, and a fair amount of luck ensured his escape. It could have gone the other way. Illness, hunger, thirst, and the fact that Caucasian prisoners couldn't blend in with the native population made recapture more than likely. Being recaptured by the Japanese always resulted in the sa You can count on one hand the number of successful escapes from POW camps in Asia during World War 2. The author of this book was one of those men. A combination of sheer willpower, friendly Sumatran and Javanese natives, and a fair amount of luck ensured his escape. I read this to completion because it was a great story but it was not great literature. Naturally, the dialog had to be reconstructed from memory, taking place months or years before under extremely harsh conditions. Still, this is how the conversations read; artificial not natural. There were a couple of factual errors. Also irksome were at least 7 typos; I rarely encounter that many in a small book. I loved this book and highly recommend it. It is a great testament to the multi-faceted aspects of humanity, accentuated by crisis. The book is wonderfully narrated and will be unforgettable. I loved this book and highly recommend it to anyone, except perhaps Japanese (since they were the strong and menacing protagonists in this book). The story represents a great testament to the multi-faceted aspects of humanity, accentuated by crisis. 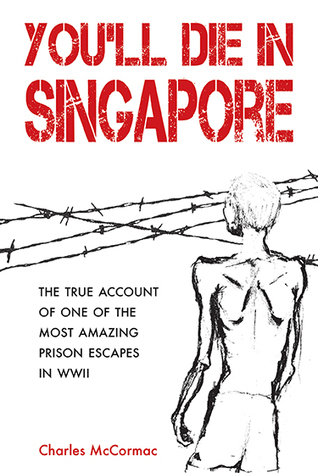 Taking place in then-occupied Singapore and Indonesia, "You'll Die in Singapore" autobiographical chronicle of an escape involving 17 POWs, mostly Brits and Australians, from a prison camp in Japanese-occupied Singapore during the end of World War 2. A gripping read, I say. A recommended read for anyone who is familiar with Singapore and Indonesian history in general. A remarkable story of escape .Once started a tale of intrigue from first to last.the highs and lows having to trust unknown people ,with one aim ,Freedom. Amazing!! Love these courageous story's of what people went through in war and what they had to do to stay alive! !